When you only need one marker! Tough times mean education budgets have been slashed across the board. No area receives more scrutiny than school supplies. Administrators look to save money and teachers plead their cases to retain all of their teaching tools. While teachers can order 12 of our whiteboard markers at one time, they can also order individual markers to save the school money. The Whiteboard Pen is the same type of marker found in our 12-pack of markers. It does not emit noxious fumes and it is smudge resistant until you wipe the board clean with our cleaning solution. 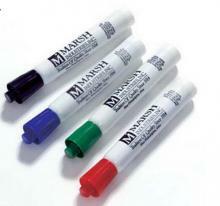 Teachers who possess a wide variety of marker colors, but may be missing one, should consider rounding out their color schemes by ordering the Whiteboard Pen.